Making fun of the government can be artistically profitable. It can also help maintain sanity. 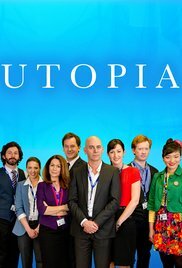 Few shows have mined the mincing horror of bureaucratic democracies as well as Utopia (Dreamland), the Australian series about an imaginary government authority charged with oversight for large infrastructure projects. And who doesn’t hold a special place in their internal fires for governmental stupidity? Yes, Minister plumbed similar territory, but its focus was less bureaucratic and more executive incompetence. W1A (and its predecessor Twenty Twelve) also trawled the insanity of bureaucracies. Maybe it is a sign of sophistication? Executives are where bad ideas are born and bureaucracies are where good ideas go to be twisted beyond recognition. I found relief from office insanity in seeing the reflection of the ridiculous aspects of my work life on the small screen. Acknowledgement that I was not alone surely served to make it easier to cope when things felt their worst. I was not so precious as to leave myself out of the mix, either. My own idiotic behavior was no less provocative than anyone else’s. But, laughter is one of those steps toward forgiveness. So, why have I left a couple episodes of the last season without watching them? Initially, I followed past patterns by leaving parts of short-run series for the future. You never know when you might need them. Call it an investment in my emotional future. Whatever your politics, new administrations tend to inspire uncertainty. That can be a good time to watch a comedy about the government and be reminded that they are all just a bunch of idiots who will accomplish little, but I’m not really ready for Dreamland (let alone Utopia). Our new administration has been embarrassing and offensive and incompetent in ways that move beyond satire. Sure, funny is funny, but we stepped in something that inspires curse words. We’re not the first to live in a country that has done so. As our jokes develop pointy ends and our barbs become sharper, we can see the world changing in front of us. I have often written about the power of art to communicate feelings and ideas from the artist to the audience- usually a personal experience. When the world needs art to communicate objections to power in code, then we need to change those in power. You’ve Got to Check This Out is a blog series about music, words, and all sorts of artistic matters. It started with an explanation. 162 more to go.